Is Amazon FBA Right for Your Business? The choice of whether to use Amazon FBA (Fulfillment by Amazon) for your eCommerce store is not an easy one. The comprehensive fulfillment service seems attractive at first look. But there are downsides, some of which aren’t apparent at first. Just like understanding your customers and margins, this choice is about nuance. This guide will help you understand how FBA works and help you get started on the decision-making process. Amazon FBA allows businesses to focus primarily on sales and marketing for their online store. Amazon takes care of the storefront software while they build out the product pages on their site. When someone orders from their pages, Amazon will get the order and fulfill it. What’s great for the program is that it has expanded so Amazon FBA can be used to fulfill orders on your own website too. All sales channels can rely on Amazon to do the fulfillment, so there are fewer inventory concerns on your part. This also means that Amazon has your goods in its warehouse. It can pick, pack, and ship the order once it arrives. In a limited sense, Amazon also provides customer service around the shipping aspect of things. It does not provide service around quality concerns. Amazon also applies its own shipping and returns policies in many cases, so it can control how some goods come back. This is called 3PL fulfillment services when a third-party does the order picking, packing, and shipping for you. All the acronym really means is that someone else is handling the operations. If your customer asks for tracking information, your partner will be the one that has it and should be willing to share it. Many small businesses and eCommerce businesses find that FBA provides a valuable service that’s a great value. Here are some of the most common features that business owners say they like about FBA. Growing a business can be difficult, especially as your costs fluctuate. Amazon FBA is transparent about your costs and provides easy estimation tools too. 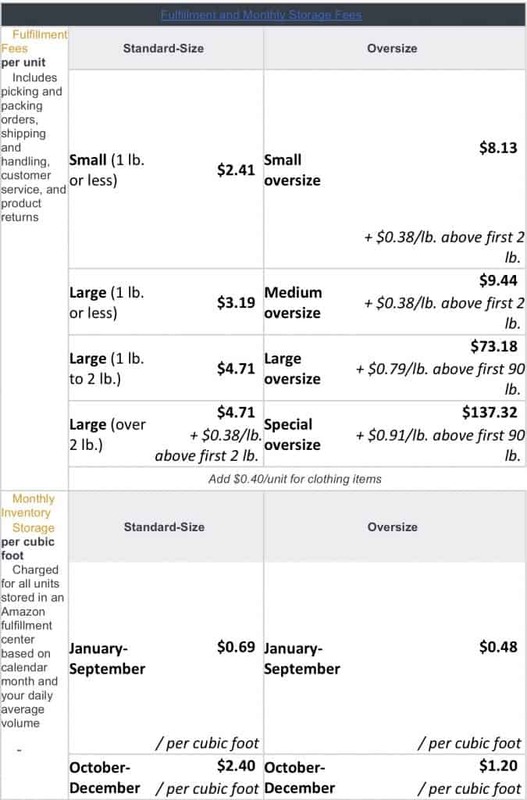 In the section on costs below, you can see some of Amazon’s basic costs and fees, from warehouse to shipping costs that include service, support, and even returns processing. Your FBA costs include customer service provided directly by Amazon, which is a big win for most companies. Amazon’s consumer-friendly policies give people confidence to shop on the site. With Amazon FBA, you get a piece of that. Your customers can reach out to Amazon at any time through phone, email, or chat. Amazon provides high-quality, reliable support. You don’t need to staff a customer service line at all hours of the day and night. Amazon also handles returns through its Online Returns Center. Customers can easily return products or adjust orders, and Amazon takes care of the reverse logistics for you. It is worth noting that you’ll have to pay return fees when your orders come back to Amazon. Prime members automatically get the Amazon Prime Free Two-Day option on your goods. You also get listed as a Prime option when people sort search results. If you’re anything like us, that filter is almost always clicked when you first start looking for a product — and usually still checked when you make the final decision. Understanding and planning for shipping costs can be difficult for new and growing eCommerce businesses. Amazon makes that easier by giving you and your customers access to better options. FBA products are available for free shipping to customers. Free shipping is a top incentive to get people to buy from online stores. Up to 47% of shoppers won’t complete a purchase if it doesn’t come with free shipping; most customers expect shipping to be free, even if their order is under $50. They also think that two-day shipping is the standard. FBA support now extends to your larger presence on the Internet. You can turn over your entire warehousing and fulfillment to Amazon for sales channels, including your website. This gives your customers access to all the FBA delivery options as well as returns support, which is great for those who want two-day shipping options. If you’re selling on social channels, there’s help there too. You can connect your Amazon accounts to your Facebook and Twitter accounts to link to listings on these pages or in posts. This makes it easier for customers to buy your products, while still giving them the benefit of your FBA. Having one partner manage your order fulfillment makes business easier. It takes less effort to try new tactics for sales and new channels. How Do I Know if Amazon FBA is Right for My Business? When you’re deciding if Amazon FBA is right for you, consider how hard you work to stay on top of your fulfillment. 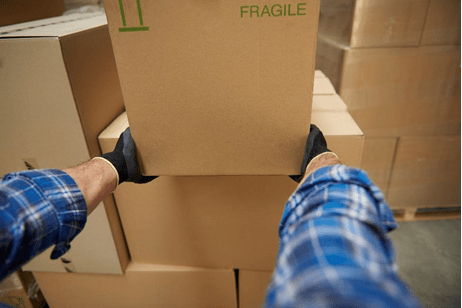 If you’re struggling with any part of the fulfillment process, FBA can be beneficial. It is also a smart fit for companies that want to innovate or try out new channels. FBA can free up your brain power by allowing you to focus on everything but fulfillment. One key area that might help is if your business is online only or if you’re trying to figure out how to scale up a small retail business with a new online store. Venturing out into a new area can be scary, and the consistency of Amazon costs are beneficial for understanding what you can afford. FBA is also a good fit if you go through the next section on costs and it looks like Amazon will reduce your monthly shipping and warehousing bills. Here’s something that might be good or bad depending on your business, so we’ve popped it right in the middle. Amazon allows you to pay for its FBA service based on what you use. It’s relatively transparent. You can work out all the details with Amazon as soon as you set up your business and start adding products. The company also offers a calculator that you can use for estimates on your specific products. Find it here. You’ll find some additional information on the extra costs for oversized or odd-sized equipment, extra storage costs for goods that sit in the warehouse for more than six months, additional costs for some returns, and even other costs that vary by product (like adding $0.40 per unit of clothing) or season. Amazon offers plenty of help with understanding not only the general costs, but also some of Amazon’s specific features, like its Small and Light fulfillment program that can reduce costs on those tiny items that you ship. It might be a safe way for you to protect small margins, and it’s definitely a smart method for Amazon to entice businesses focused on small products. At the same time, it’s worth considering that there are some cons to using FBA. Here we’ll look at a few that you should be aware of and what they might mean for you. The size of your business and your products are good determining factors to see how many of these will apply to you. While Amazon will get your products to customers, you’ve got to send them over to Amazon first. Unfortunately, many small businesses struggle with Amazon’s burdensome requirements around this process. First, you’ll need forecasting to understand what you can expect to sell. Then you’ll need to prep those products for shipping to Amazon. You will have to properly label each item according to Amazon’s guidelines. Its ASIN/UPC system requirements might mean you have to label things individually, even if you sell them as a group on your regular store. The process gets more complicated and time-consuming as your product catalog grows. It’s such a time drain that you can pay Amazon to do this breakdown and labeling (cost-prohibitive for some) or turn to inventory management tools that can do the label printing for you. This is a cost that you might not have considered when you first thought about using Amazon FBA. Having Amazon handle your returns can initially sound like a selling point. The downside of this is that Amazon favors the customer. Amazon makes returns incredibly easy for the customer. This means that you could face increased costs in your returns. 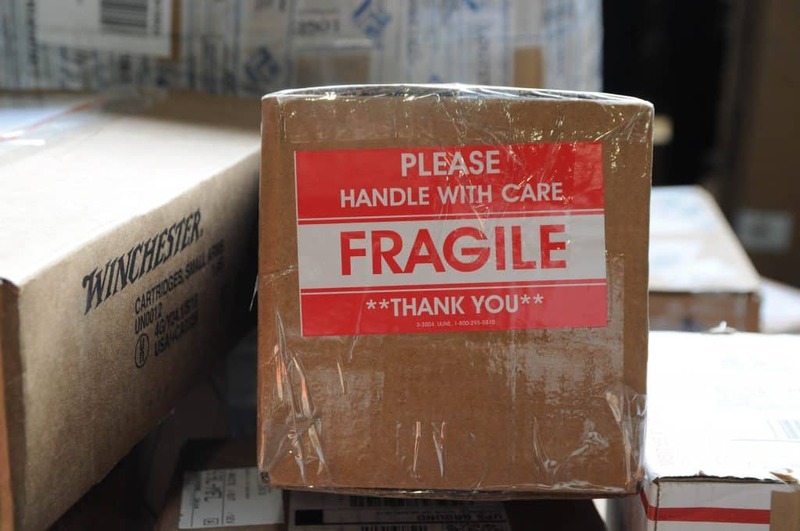 Some businesses have reported that their customers will say a product arrived damaged or did not match a listing to avoid costs associated with returning it (even after the customer has used the product). Saying a product is low-quality or that it came used also allows them to return it in almost any state. Amazon will trust its customers over you, and then you’ll have to eat the return fees and maybe even lose inventory. You do lose some branding potential when Amazon fulfills your orders. You can’t use a custom box or packaging, Your goods might arrive in a generic Amazon box with products from other shippers. If you’ve spent time making a custom logo and strategically placing it on your packaging, it could be overshadowed by commingled goods. These commingled shipments are designed to reduce overall costs for you. Commingling means that your customers don’t necessarily get the product you provided to Amazon FBA. This is worth diving into to understand how FBA handles your stock in its warehouses. Let’s say you and another seller (Seller B) provide the same sunglasses or jewelry. A customer buys from your Amazon page and you get the sale. However, the customers live closer to a warehouse that has Seller B’s goods. Because Amazon sees these as the same, it uses Seller B’s inventory to fill your order. This type of inventory swap can make it very difficult for you to maintain product control. Sometimes, Amazon’s judgment that the products were interchangeable is wrong. Customers may return the product if it isn’t the right color or doesn’t match other parts of the product description, which hurts your business reputation and increases your Amazon FBA costs. Note: Seller accounts typically use manufacturer barcodes to track inventory. If you want to change this to a new barcode that you create, then you can do this manually in your account. It creates more work for you but could prevent commingling because Amazon uses manufacturer barcodes for commingled fulfillment. When a topic needs its own specific help page, you know it’s going to get a little complicated. Welcome to tax compliance in the world of FBA. Sales tax under FBA can be hard to determine and calculate appropriately. Or, as Amazon puts it, using FBA means you’ll need to manage multi-state sales tax compliance because your business changes overnight in terms of sales tax obligations. Every Amazon FBA distribution center that you send your inventory to requires these considerations. As you grow, so could this complexity. If you don’t handle it, you could be liable for some fines, fees, or other increased costs. Amazon FBA has long-term storage fees that it uses as an incentive to get you to only send it products that’ll sell in under 180 days. If goods sit longer, you face an increased cost either per cubic foot of space you take up or per item, depending on what’s higher using Amazon’s formulas. Thankfully, Amazon listened to its FBA customers and reduced these rates in the fall of 2018. Now it isn’t as painful as it used to be, but it can still be expensive if you have high-margin items and you only need a few sales a month to stay in the green. Another nice element is that Amazon looks at your inventory holistically and applies FIFO (first-in, first-out) rules. Say you have 30 units of a product across three warehouses and one sells. Regardless of where that product physically ships from, Amazon considers that you’ve sold the one that’s been in any warehouse the longest. The same page where you can learn about Amazon’s storage fee changes is also a good place to find out about how Amazon reacted to carrier dimensional weight changes in 2018. If you’re not sure what that means, head over here to learn about the process and calculate weight costs. As noted earlier, heavy, oversized, and odd-shaped products cost you more to store and fulfill through Amazon FBA. Amazon adds $0.38 per pound above the first 2 pounds when it fulfills heavy units that are in a standard-size box. If it’s an oversized order, costs range from $0.38 per pound to $0.91 per pound above the first 2 pounds. While storage for oversized items is slightly less per cubic foot, they tend to take up more space, so you’ll often pay a higher per-unit cost too. 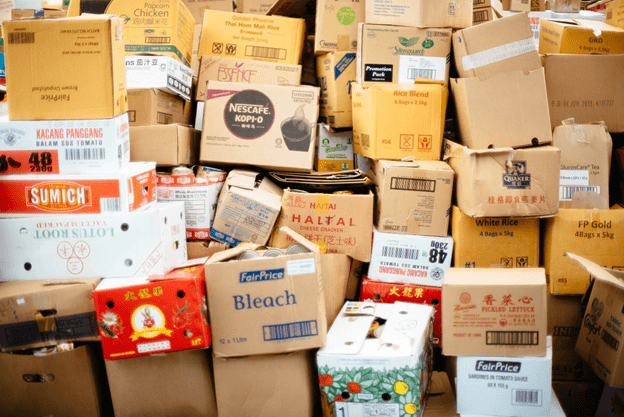 Even if you don’t end up using Amazon FBA, there are some serious downsides about selling on the Amazon Marketplace that you should consider. A recent investigative article by The Verge, cheekily titled Prime and Punishment, makes it clear that if your Amazon product is successful enough to win the coveted Buy Box, there seems to be a higher probability that it will become a target of jealous saboteurs. This could get you banned from selling, which would undo in a day all the hard work you put into building a business on Amazon. Another serious issue for Amazon sellers is Amazon’s white label products. Sellers have complained that Amazon knocks off successful products and undercuts their sales. Look for more information about the pitfalls of the Amazon Marketplace in a future post. There are a few big reasons that other fulfillment options may be better than FBA for a business. First is if you’ve got low profit margins. FBA costs cut into margins, sometimes significantly. The rule of thumb sellers tell us is that you want a 250% or higher markup on your average order to stay profitable with Amazon FBA. Another worry is if you have heavy or large objects. Amazon’s costs quickly rise here, while there are other specialty order fulfillment services that focus on these types of products and have practices to keep your costs lower. You might also want to consider another setup if you aren’t selling a lot on Amazon. FBA has product and volume restrictions. You’ve got to get to a high volume to use some of its most business-friendly options. If you’re a control freak when it comes to the sales process on your website, don’t forget that the downside to selling on Amazon FBA is that your sales come through Amazon. For companies that want to keep everything, including sales, on bespoke WordPress eCommerce sites, it can be difficult to accept the branding shortfalls of selling on Amazon. The final thing to consider is if your current software setup works with FBA. If it doesn’t, you could be facing a significant cost to replace your existing software and will have to learn that platform as you’re learning FBA. Your decision to use FBA or not use FBA isn’t just a fulfillment decision. It’s a business decision. How much do you need to leverage Amazon FBA to make your business successful? How much do you want to hand off to Amazon FBAto see if you can grow? Amazon, especially with Prime, gives you access to a large number of customers. You get a great audience that can easily search for your products. And FBA offers many fulfillment options that are right for growing eCommerce businesses. If you’re already selling primarily through Amazon, you might be able to achieve benefits through FBA that are worthwhile. This can be the case even if Amazon is only one of your many successful channels. FBA’s support could keep you profitable as you grow on your own site too. At the same time, you’ll be handing over control around returns and customer service, which might not be right for your brand. There are also potential increased costs for storage and other services. You’ll have to take time to label your products to comply with Amazon’s strict guidelines. There there are the extra hours spent keeping up with sales tax compliance. It’s an important decision that you shouldn’t take lightly. Amazon Buys Whole Foods: Has Food Fulfillment Service Come of Age?